A Tisket, A Tasket, Freebies for your Basket! Several phenomenal teacher bloggers are joining forces for an amazing bunny blog hop! As you follow us along the bunny trail, you will visit some fun blogs each with a free resource. Here's the freebie for your basket! 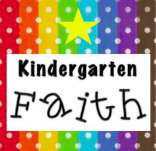 Next up with a Freebie for your Basket is Faith from Kindergarten Faith. Just in case you didn't join us from the beginning, here is an ordered list of all the participating blogs. I love your freebie! I will most certainly be using it when I return to school from break. My students will love it! Great - glad you can use it! Thanks for this great freebie! Perfect for this time of year! Thank you for the freebie. Have a Happy Easter! Thank you for the freebie. We are working on telling time. I am a new follower and fellow first grade teacher. I love your comment in your "About Me," that blogging is cheaper than therapy! Thank you for the freebie. We are just finishing up telling time, so this will be great to put in out math tubs for review. Thanks so much for this cute freebie! Great "timing" for our class! Thank you for the "Ladybug Time" center freebie. I'm in Virginia as well and as you are already aware, telling time to the hour and half hour is one of the Virginia standards of learning under the measurement strand 1.8. I was able to post on your blog using Safari. A bit off topic, but I saw your "Light It Up Blue" graphic and was wondering if you could tell me how I could obtain it. Thank you. I also got a cover for my FB page. Thank you for the time freebie. Several of my children are having a hard time with time this year:( Spent lots of time driving south and then north through VA over Easter break traveling to and from SC. You have such a beautiful state! Couldn't believe their was snow on the mountains the entire length of Route 81. Thanks! I actually live a couple of hours east of I81 - not so much snow for us:( But I grew up in the Shenandoah Valley (where you drove through) and it is beautiful. It's snowing there tonight as a matter of fact - just received some video from my mom! It's supposed to be April RAIN showers - not snow showers!